For over half a century, the Jackson Tougaloo Alumni Chapter (JTAC) has sponsored the Thelma Sanders Scholarship Dance (TSSD). For many years the dance was considered the “social event” of the holiday season. The dance provided an opportunity for alumni, friends, family and those who returned to Jackson for the holidays to gather and reconnect with old acquaintances while supporting a worthy cause. 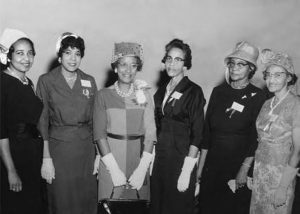 Traditionally held during the Christmas season, the dance was the brainchild of the late Thelma Sanders(2nd from the left above), a prominent Jackson business woman and civic leader who graduated from Tougaloo College in 1946. JTAC will host its annual Thelma Sanders Scholarship Dance on Wednesday, December 26, 2018, at the Hilton Hotel, located at 1001 East County Line Road, Jackson, Mississippi. 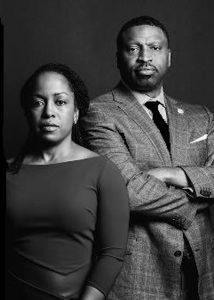 This year, we are happy to honor NAACP President and CEO, Mr. Derrick Johnson ’93 and his wife, Attorney Letitia Johnson ‘96. We are inviting everyone to come out for an evening of dinner, dancing, and reuniting as we show appreciation and honor the Johnsons. Music will be provided by Jackson’s own Coop D Belle. You don’t want to miss this event (providing much needed financial support to students of Tougaloo College.) Contact Carolyn White(carolynjwhite@bellsouth.net / 601-946-5291) or Donna Davis(donnadavis0503@gmail.com / 601-924-4725) for tickets or more information.